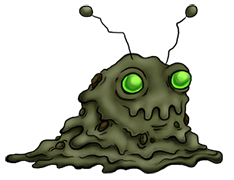 Littervore is a common Kreature which inhabits urban areas and garbage dumps. Despite its appearance, it was not born from pollution: it was bioengineered to assimilate it and metabolize any harmful chemicals. Though it can secrete foul corrosive liquids to defend itself, this substance is biodegradable and has no lasting effect on the environment. A nice trash monster. The solid bright green eyes along with the antennae make it look simply adorable.